Uyuni feels like the end of the Earth. Miners and tourists converge in this lackluster utilitarian transit hub. 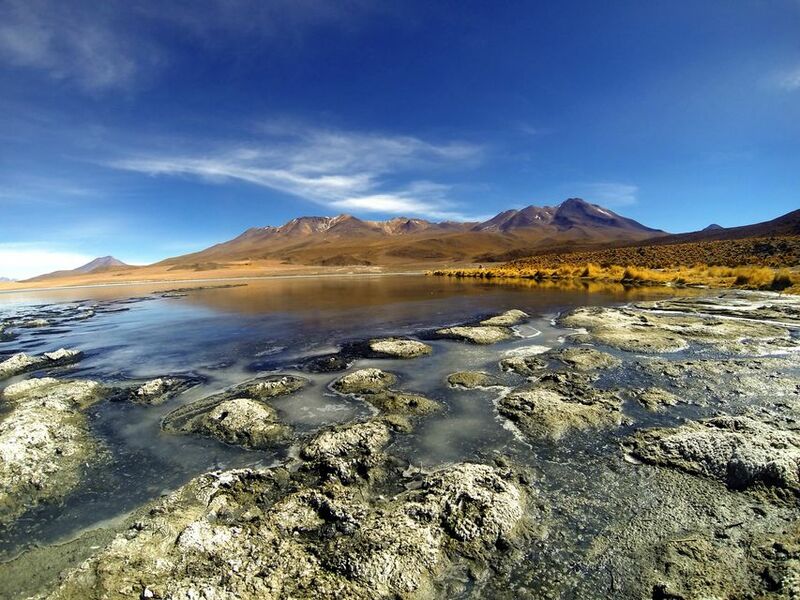 A good place to find inexpensive lodging near Uyuni and stock up on supplies. Uyuni Salt Flat is a must see natural wonder in Bolivia. Uyuni is a town where salt miners lived before, today its just a tourist town, a starting point for the tours. The best experience is to cross the Atacama .n 3 days, starting in Chile, and ending the crossing at Uyuni Salt Flats. the city is so poor but it has so much to offer. one of the most beautiful places in the world. Uyuni is a small town in Potosi, and the main starting point for visiting the famous Salt Flats of Uyuni. The town itself isn't all that special, but the salt flats are spectacular, a true natural wonder and some place you need to visit if you are traveling in Bolivia. Do a bit of research and haggling when picking one of the tours to the salt flats. There are a lot of companies and not all of them are equally good. Also try to do a tour that takes you to the colored lakes. Uyuni is a very cold hole at a very high altitude. There is supposedly the best pizza restaurant in Bolivia here, but truthfully that is not saying much. Come here to see the salt flats and the southwest circuit, and move on. I think this is supposed to be a review of the town Uyuni and not the actual salt flats... if it's the salt flats it's a 5, if the town, a 3. Anyway, the town itself is just for people to book a jeep tour and rent a sleeping bag. Other than that, just a dusty little town with the occasional expanse of outside market, selling cheap toys, blankets, and all the other random bits your would usually buy at Target or Walmart. Uyuni is a real mirage, the world's largest salt flat, there is no difference between heaven and earth. The Salar de Uyuni and the surrounding area are wonderful and magical places to be visited in Bolivia, the entire trip takes approx. 4 days visiting the lakes of the region, amazing giant rock formations, like the stone tree, volcanoes, lichens and can admire the flora and fauna vicuna, llamas, flamingos, etc. The Salar de Uyuni is a place that surprises visitors by its size, color and beauty, the island caktus Inkawasi with ancient giants. Fall short to describe it but it's worth a visit.